When can babies have sweet potato? 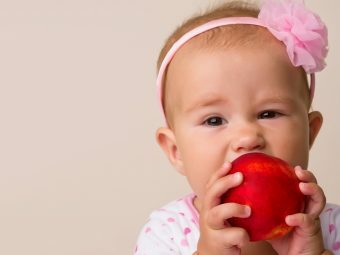 Can a baby be allergic to sweet potato? It is sweet, rich in carbohydrates, and a great source of beta-carotene. This humble vegetable called the sweet potato can be a great source of nutrition for your growing little one. Sweet potatoes are rich in several essential nutrients such as potassium, calcium, and vitamins A, C, and B-complex. No wonder that many moms are keen to introduce sweet potato in the diet of their little ones. 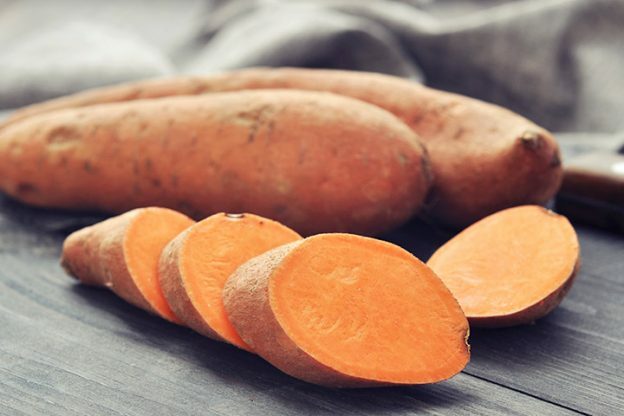 Just like with any new food, you may have many questions about sweet potato too! – “What would be the right age to introduce sweet potato to my baby? What could be a few simple sweet potato baby food recipes?” And so many more questions! This MomJunction post addresses your curiosity pertaining to sweet potato while also providing some amazing and easy sweet potato baby food recipes. Read on for more. 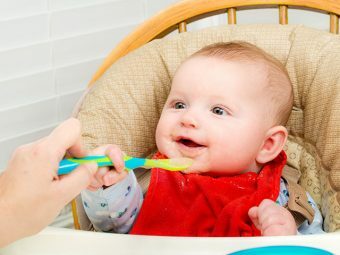 Your baby can eat sweet potatoes after six months of age, which is the time when he can be introduced to solid food (1). You will also be introducing other vegetables in his diet as finger foods, therefore, introduce one vegetable at a time to make sure the baby is responding well to that particular vegetable. If the baby refuses to eat sweet potato (or any vegetable) give it a break and reintroduce it after a week or two in a different format. Sweet potatoes are high in carbohydrates and vitamins that are important for your baby’s growth. They also have other health benefits. Sweet potato is an amazing baby food that comes packed with vitamin A that is needed for the healthy development of the eyes while it also has a lot of beta-carotene, a compound that synthesizes into Vitamin A in the body. Sweet potato thus has an incredible 14187 units of Vitamin A (2). That makes it a vegetable with one of the highest overall concentration of Vitamin A making it an ideal solid food for your growing baby. Sweet potato is a good source of starch and dietary fiber. The body breaks starch into sugars and uses it as energy. While dietary fiber is helps in digestion. It is not just vitamin A but there are other several vitamins present in sweet potato viz. vitamin C, E, K, and vitamin B1 to B6 and B9. Babies need a steady supply of these vitamins for a healthy development of various organs and in attaining their developmental milestones on time. Minerals ensure the healthy metabolism of various processes in the body. Guess what? Sweet potato is a champion even in this department! 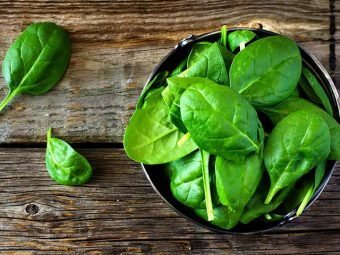 It is a source of nearly all important minerals that a body needs, namely calcium, iron, magnesium, phosphorus, potassium, sodium and even zinc. How To Select And Store Sweet Potato? Select: Choose sweet potatoes that have smooth and bright skin with little blemishes. The skin color should preferably be uniform across the vegetable. Do not buy those that have deep holes or cuts on them, as it could be home to worms. Sweet potatoes can be prone to decay due to improper storage. Therefore, check for any sign of discoloration or liquid oozing out of it. Also, buy these vegetables from a trustworthy market to avoid purchasing ones, which are contaminated with pesticides. Storage: There is no need to store sweet potatoes in the refrigerator. You can store them at room temperature. You must consume them within a week. If you intend to store them for longer, then you can keep them in a cool, dark, and dry place (such as a cellar) where the temperature is around 15ºC. However, do not store them for more than a month. 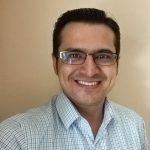 How To Cook Sweet Potatoes For Babies? Baking: Baking makes the sweet potatoes soft and palatable without making them soggy. Just preheat the oven to a temperature of 200ºC. Poke holes into the sweet potatoes and bake them in the oven for 45 minutes or till they reach the desired softness. Once done, just cut them into two halves and scoop the pulp out, which you can then mash or puree. Boiling: The easy way. Simply peel the sweet potatoes, toss them into a pressure cooker and cook for up to three or four whistles. You can also chop the sweet potatoes into small pieces before putting them in the cooker. Reuse the stock water while making the sweet potato puree or mash. Steaming: Steaming brings a unique tenderness to the sweet vegetable. Peel the sweet potato, slice it in half, place them in shallow water in a frying pan and steam them on medium flame for 20-25 minutes or till desired tenderness is achieved. You can even use a steaming rack to get that classic steamed vegetable taste and look. Barbecue: Where there is party there is barbecue! When it comes to your baby’s party food you can give him some roasted sweet potatoes. Use the barbecue grill to roast sweet potatoes wrapped in aluminum foil for 45 minutes on the coal. This will give you results similar to baking with a unique taste that your baby will love. Now that you know how to cook sweet potato let’s see the various baby food preparations you can make with the sweet potato. Sweet potatoes can be great first food for babies since they can be cooked and mashed for the baby to eat. In fact, you can puree sweet potato alone or in combination with other vegetable or chicken. It is a great way of feeding it to your baby. All these sweet potato puree recipes are ideal for babies older than six months. Preheat the oven to up to 200ºC. In the meantime, wash and scrub the sweet potatoes and poke holes in them. Do not skin them. Once the oven has attained the temperature, place the sweet potatoes on a baking tray and bake them for 45 minutes. Once they are baked, remove them from the oven and cut the sweet potato into two halves. Then gently scoop the pulp from the skin and put it in a blender. Add some water to homogenize and thin the consistency. Blend this mixture, and your homemade sweet potato puree will be ready. You can even steam the sweet potatoes instead of baking them. To steam them, peel the sweet potatoes and dice them into small pieces. Put them in a pan with water that submerges them halfway. Cover the pan with a lid and steam them on a stove for 30 minutes or until they become completely tender. Strain the excess water and put the steamed sweet potatoes in a blender and proceed with the blending process as mentioned in step. It is a simple and easy homemade sweet potato recipe with the added advantage of apples. Bake or steam the apples and the sweet potatoes. You can cook them together. Put the pulp in the blender. In the case of apples, you need not remove the skin since it has a lot of nutrition. But make sure you blend the mixture well so that there is no coarse skin left in the puree. Use water to thin the consistency. Once blended, feed this delicious puree to your bundle of joy. Boil boneless chicken and sweet potatoes separately. You must boil them till they are soft and cooked well. Do not throw away the chicken stock since it can be used later. Peel the sweet potatoes and slice them into small pieces. Put it in a blender along with the chicken pieces. Pour some chicken stock to thin the consistency and blend this mixture. Once it has been blended well, pour this puree into a bowl and your homemade sweet potato and chicken baby food is ready. Take some cooked sweet potato pulp along with boiled peas and put them in the blender. Blend them till they reach a homogeneous texture. You can add apple sauce to sweeten since peas can be very bland in taste. Use water to thin the consistency and once done you have some healthy sweet potato and peas baby food ready for your little one. This is a quick, nutritious recipe, which can come very handy, especially if the little one is hungry in the nights. This is an amazingly simple sweet potato baby food recipe which can be made in combination with another vegetable. In this case, we use carrots. You start by grating the carrots and cutting them into small pieces. Cook them together with sweet potatoes in a pan of water till they are completely steamed. Put the cooked carrots and sweet potatoes in a blender. Use the vegetable stock to thin the liquid. You could also use water to do so. Blend the mixture until the desired consistency is achieved. You can serve the sweet potato and carrot puree as a dinner or lunch food item to your baby thanks to its high nutritional value. Below are more great ways of feeding the sweet vegetable to your little one! Sweet potato mash is great when your baby is getting a significant chunk of nutrition from solid food. The first step here in this recipe is exactly the same as mentioned in sweet potato puree. This means you either bake the sweet potatoes or steam them to cook the pulp. Once the baked/steamed sweet potato pulp is ready, you mash it using a masher or a spoon. Add some water to thin the consistency but do not add a lot since you would like the sweet potatoes to retain their solidity. Once they are mashed with a few large lumps, you can feed it to your little one. Bake or steam the sweet potato pulp and add it to a dish with finely-chopped banana pieces. Mash this mixture and use water to thin the consistency. Once mashed, the sweet potato and banana baby food is ready. You can also puree this mixture if your baby loves purees over mash. Cook the minced boneless chicken with water in a cooking pot to make a chicken broth. Keep cooking till the chicken is tender enough. Do not strain the water. Take one cup of baked or steamed sweet potato pulp and put it into a blender. Pour the chicken broth and blend the mixture till the desired consistency of the soup is achieved. In case you would like to dilute the liquid, then add freshly boiled water to the blender. Once done, pour the soup into a bowl and serve it to your little one. This makes a wonderful sweet potato baby food recipe for your weaned little one when he is still in love with a liquid-based diet. Porridge can be made with any grain but rice is easy to digest, therefore, we use rice here. Put one cup of washed rice in a cooking pot. Peel some sweet potatoes and dice them into small pieces. Add these pieces to the rice. Add three cups of water and one cup of milk to the cooking pot and cook the mixture. Bring the mixture to boil and simmer for 10-15 minutes. You can add more milk to make the porridge more palatable to the baby. Once the ingredients are well-cooked you can serve this delicious porridge to your baby. Start by mixing sweet potato, egg, flour, and baking powder in a mixing bowl and stir them well. You then add the milk and one tablespoon butter and stir the mixture properly. The consistency should be thick but without any lumps. Take a deep non-stick pan and add the remaining tablespoon of butter to it. Once the butter is a bit warm add the batter to the pan and cook it till you see bubbles coming out of it. Remember, to pour the batter in uniform layers for more symmetrical pancakes. Flip the pancake and the cook the other side for two minutes. Once done, put the pancakes on a plate and wait for them to cool down till they are at a comfortable temperature for your baby to munch on. Take the mashed sweet potatoes, oil, apple sauce, and water and pour them into a mixing bowl. Stir the mixture well. Add baby cereal and flour to this mixture. You can add extra baby cereal in case you want the batter to be coarse. Once you are done mixing, the sweet potato dough will be ready. Wrap the dough in a cookie sheet or a clear plastic sheet to make a dough cone. Cut the tip of the sheet from where you pour small drop-shaped servings. Take each serving and roll them into a ball, between your palms. Once done, make a small hole with your finger at the center of the ball to leave an air bubble thus giving it a puff-like appearance. Place each puff, with the hole side down, on the baking tray. You can grease the baking tray with a touch of vegetable oil to prevent the baked nuggets from sticking to the tray. Preheat the oven to 350ºC and bake the puffs for 15 minutes. Shorten the baking time if you want the puffs to be soft and chewy. Let them cool a bit before your baby eats them. Peel the sweet potatoes and cut them into wedge or fries-like shape. You then have two options – either use these wedges as it is or coat them with a layer of baby cereal. A coat of baby cereal can help make the wedges more chunky. Preheat the oven to 200ºC. Grease a baking tray with a bit of vegetable oil and place the coated or uncoated sweet potato wedges in it. Drizzle some vegetable oil on the wedges and bake them for 35 minutes. You can bake them for longer in case you want a crispier texture. Let the wedges cool before your baby enjoys them. You make sweet potato fries in the same manner. All you have to do is cut the sweet potatoes in the shape of fries. Sweet potato chips and sticks are made the same way by just cutting them in different ways. You can feed these sweet potato baby food preparations whenever you like. There are other ways of feeding sweet potato to your baby, by combining it with vegetables and cereals. Some foods can taste great when in combination with sweet potato. 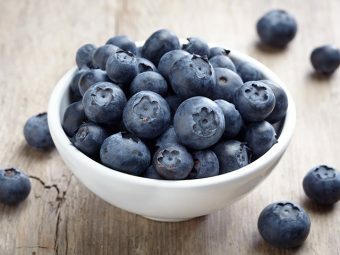 Take the advantage of its sweetness and combine these foods to make them more palatable to your little one. Vegetables: Babies may find vegetables bland therefore mix them with sweet potato to sweeten the taste. You can use any vegetable like beans, carrots, peas, pumpkin, bottle gourd, etc. Baby cereals: Mix some baby cereal with sweet potato and you will find the plate get licked clean. You can mix cereals made from any grain like rice, barley, and oats. Non-vegetarian food items: Non-vegetarian food can be a hit or a miss when you feed them to your baby for the first time. To ensure he loves that meat stock and gets all its vital nutrients, mix it with some mashed sweet potatoes to add a tinge of sweetness to it. Yogurt: Yogurt and sweet potato work great together especially when the sweet potatoes are mashed. Fruits: Of course, fruits of any kind can be mixed with sweet potato to enhance the taste. Mix sweet potatoes with fruits purees to bump up their natural sweetness and make your baby relish them more. Shortness of breath: There will be a general feeling of breathlessness, and the baby may wheeze and gasp for air. Swelling of mouth: Lips and tongue will appear swollen along with swelling in neck muscles that may cause severe discomfort during swallowing. General weakness and dizziness: The baby will appear dizzy and may suddenly seem fatigued and weak as an effect of the food allergy. These are some of the common symptoms of food allergies and you must always rush your baby to the doctor in case your baby seems uncomfortable after eating something new the first time. Sweet potatoes have their own share of health benefits and should make an excellent food for your infant. So that was all about sweet potatoes and how they can make a great baby food. Have you ever tried any wonderful sweet potato baby food recipe? Do share it with us by leaving a comment below.